The Tokyo Motor Show hits keep coming from Mazda. I seem to be in the minority when it comes to liking the Mazda Kai Concept hatchback, but I think this one will be way more of a crowd pleaser. 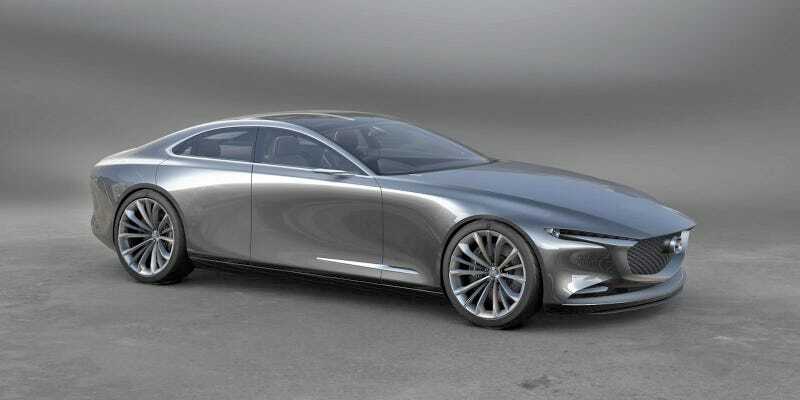 This is the Mazda Vision Coupe Concept, and we’ll forgive it for not really being a coupe because it looks so damn good. Yes, Mazda’s Tokyo concepts are a hatchback and a sedan, and not an electric crossover SUV concept like everybody else. A bold move! We’ll see if it pays off. We don’t now much about the Vision Coupe Concept yet, including what powers it, but the next-generation SkyActiv-X running gear is probably a safe bet. It draws a lot of styling cues from the RX-Vision concept, and that’s very good news. I like it a lot. It’s sleek and powerful, and kind of vaguely reminds me of a Citroën C6 mixed with an Audi A7. If the next Mazda 6 sedan looks this good, we’ll be throwing two parties instead of one. Or one big party. I haven’t decided yet. Depends on budget. Anyway, we’ll see more of this thing at the Tokyo Motor Show this week.